Fear Fest 2016 located in South Beloit Illinois is Northern Illinois’s largest and best haunted attraction. They offer 3 haunts at one location. Open Friday – Sunday September 30 – October 30th. 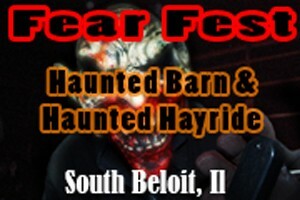 Fear Fest is located in South Beloit Illinois 1 mile east of I-90 near the Wisconsin border. This coupon allows you to save $2.00 off the price of one admission ticket. Celebrating 18 years of old fashion scares. Northern Illinois Fear Fest. The original Haunted Barn, the Haunted Hay Ride, and new for 2016 The FUN House. All set on an 1830s farm. Three events, one location, free parking. Each event $12 or a three pass event just $30. Avoid the long lines visit on Sunday’s. Just one mile off I-90 at the state line.